Last year, Jeff took me out to eat for our anniversary. We have one strictly gluten-free restaurant in town and we go out to eat only once or twice a year, so its a big deal when we get to go. Our anniversary is in April, and asparagus is in season. That day, they had a special that was a roasted sweet potato and duck confit hash served with a fried egg, asparagus and hollandaise sauce. Since I enjoy duck and I love asparagus and fried eggs, I decided to go for it. I had never had hollandaise before, but I knew it was an egg yolk and butter emulsion, akin to a warm, buttery mayonnaise with notes of lemon. I was hooked from my first bite. I can home and immediately looked up Julia Child’s hollandaise recipe in Mastering the Art of French Cooking. It was there I discovered that Hollandaise could be made in the blender! Quick, easy, no mess, no fuss recipes that taste like they’re five stars make me more than happy. Now, granted, you can’t make it as thick in a regular mega-mart blender as you can by hand, but the ease more than makes up for that. If you want it thicker, simply whisk in an extra stick of melted butter in a small, steady stream after pouring it out of the blender and into a bowl. 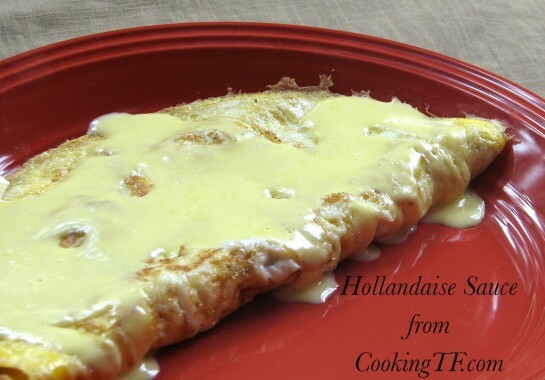 Next week, I’ll show you how to make wonderfully thick hollandaise in a high-powered blender. I have deviated from Child’s recipe some, and this is the recipe I now whip up at home while making omelets for breakfast or dinner. Here, I put dill and smoked salmon into the omelet. I purchase the smoked salmon from Green PolkaDot Box. Hollandaise is perfect with omelets since you can use the leftover egg white up by including it into the omelet with a couple more whole eggs. In a blender, combine the yolks, mustard, one tablespoon of the lemon juice and the salt and pulse until blended. Place the lid on the blender and turn onto high (or 1 in a Blendtec) and drizzle in the butter in a slow, steady stream. The sauce should thicken immediately. Add the dash of spice and pulse to combine. Taste and add more lemon juice, if needed. Serve immediately or transfer to a glass mason jar and keep warm in a pot of simmering water until time to serve. The sauce will solidify once cool, so you want to remove any leftovers from the blender before it cools. Have you managed to come up with a good sub for the butter for dairy free people? I totally miss this on my eggs. There’s one Earth Balance spread that is soy-free. It does have some oils in it you wouldn’t want to consume on a regular basis, though. It’s palm, canola, safflower and olive oils. http://www.earthbalancenatural.com/product/soy-free-buttery-spread/ I recommend just limiting it to the occasional treat like this and not regular use due to the canola oil. We have that spread for when we want to have just “butter” on our toast. We don’t use that much considering it takes us 2+ months to finish off one tub. Ok cool I’ll try that. Thanks.